I was craving salami! I love most salamis. They have almost no carbs but lots of fat and sodium. Salamis are miracles of food creation. They are perfect for cavemen diets, Atkins and the “No-White-Food” diet my chiropractor recommended over 10 years ago. I watched a Food Channel show that showed how a couple of types of salami are made. Wow, lots of work and we should (yes, I am shoulding on all of us in jest) reward their makers by eating salami. Cured, fermented and air-dried meat. Yuck!!! But sooo good. Wikipeda (http://en.wikipedia.org/wiki/Salami) tells us lot about the meat. 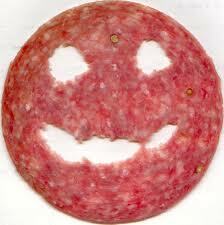 Salami can be pork, beef, lamb, turkey, venison, moose etc…. But it is meat and meat protein. It’s fermented (isn’t that for wine and yoghurt?) and stuffed into a natural or hard casing. Sometimes they even let a really healthy mold grow on it to protect it and us. It’s a penicillin mold – and I quote Wikipedia, “The mold is desired as it imparts flavor and prevents spoilage during the curing process.” Yeah, right. Back to my craving. I really wanted potato chips but since I don’t keep them in the house (very often), I knew I was going to have a struggle with the foraging or ever-eating to beat the crave. Then I remembered we went to this great meat market in Duncan. They have wonderful homemade sausages of more than 10 types and tons of cured and processed (but healthy processed) meats. I had picked up 2 small packages of salamis to try: Thurginder and Hunter. Each package was less that $2 only had a few very thin slices in it but this was the opportune time to taste them. I opened them. I peeled off a slice and took a nibble. Glory! It was toothsome, and salty with just the right amount of tang to bite the fat. It was delicious. So I tried the other. It was spicy with a delightfully satisfying heat. Yes, salt, fat, and tang. Altogether I had 4 slices and my Crave monster went away for the rest of the night and the rest of the salami went away into a zip-lock bag and into the fridge of happiness. ~ by 1fatgirlshrinking - Diane Kirby on February 4, 2012. OMG – salami is my favorite!! !